A proper outline is necessary before you can perform a task. The following outline samples cater to different categories of formal planning work such as business planning, business report, event planning, presentation, course, meeting, marketing, interview, project outline and much more. Similarly, it has outlines for informal planning like wedding ceremony, speech planning, cover letter, resume, and several other necessary works. 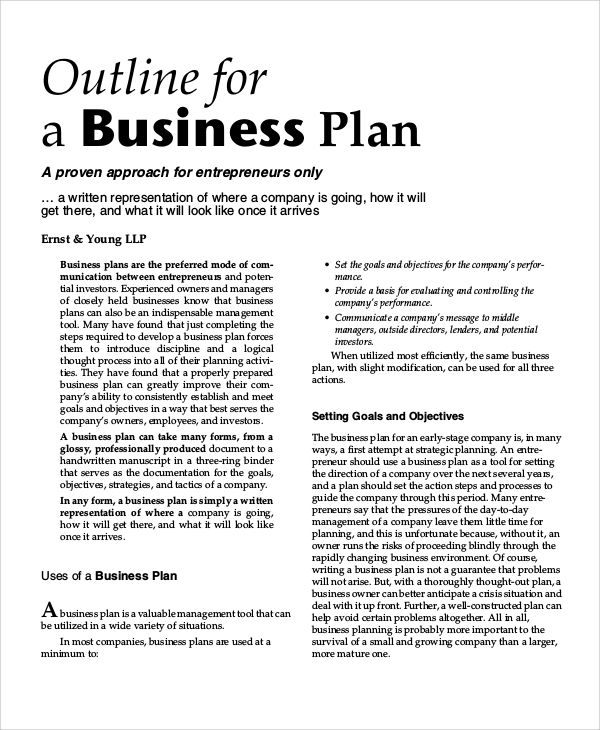 Business plan outline is mandatory before starting any business. This provided business plan outline sample is a guideline on how to prepare a full-proof business plan for the entrepreneurs to start a successful business with proper planning and weighing every parameter. Business reports are critical communication means for the senior management of any company to stay connected with the team leaders and stakeholders. 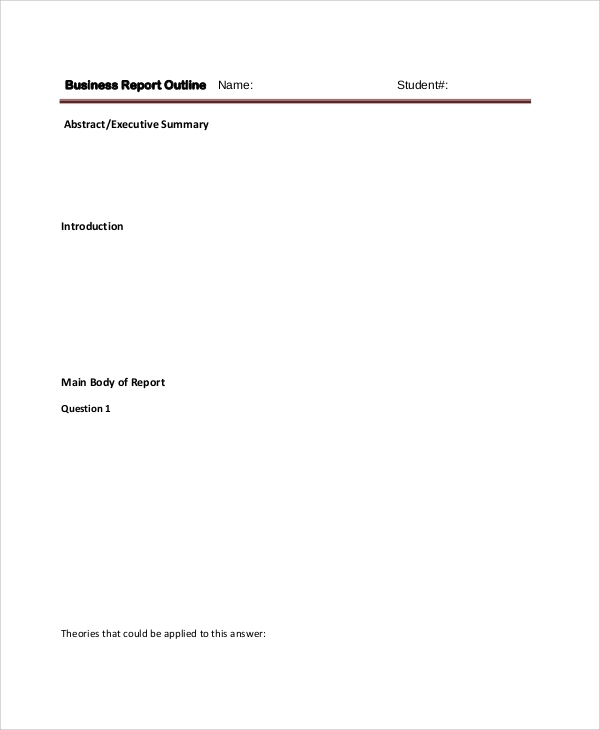 This business report outline sample provides a proper format to write it with an executive summary, introduction, questions, and answer with a proper conclusion on any subject. 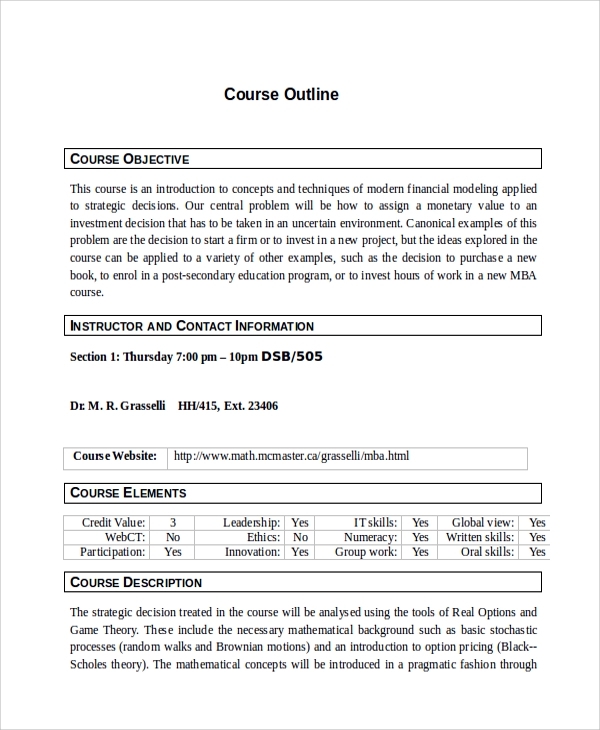 Course outline sample is very useful for any educational institute to prepare their prospectus for the courses offered to lure the students to join their institutes over others. It has headings such as course objective and description with various elements, outcomes and course material with references, evaluation process, contact details, and others. 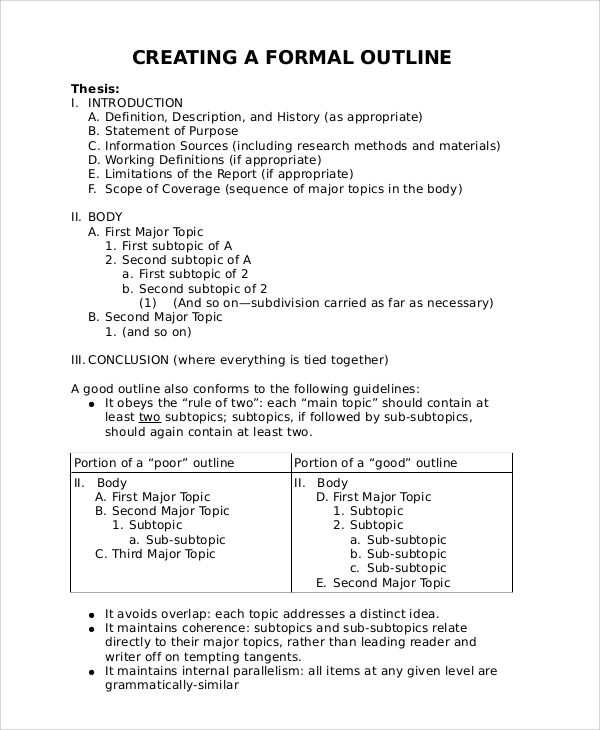 A chapter outline is mandatory to prepare a text book. 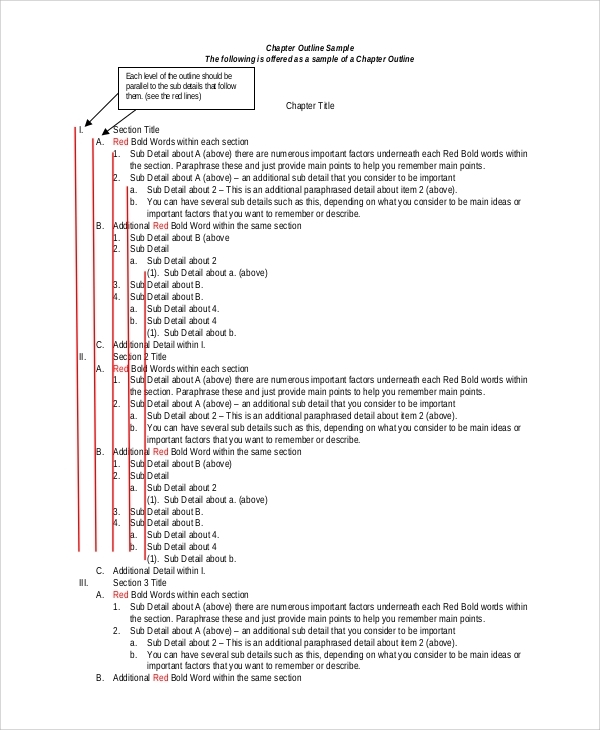 Such outline will help to keep track of the chapters and the topics covered, and they should be done beforehand. Such outlines are also useful while preparing great reports. A cover letter is the first thing an interviewer reads to decide whether to give a call to the candidate or not. 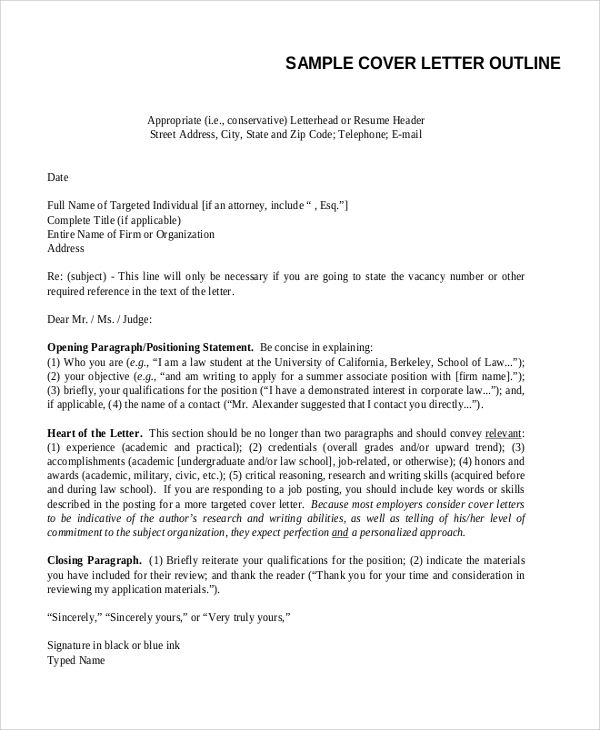 This cover letter outline sample shows how to write the most impressive cover letter that guarantees your call for an interview. 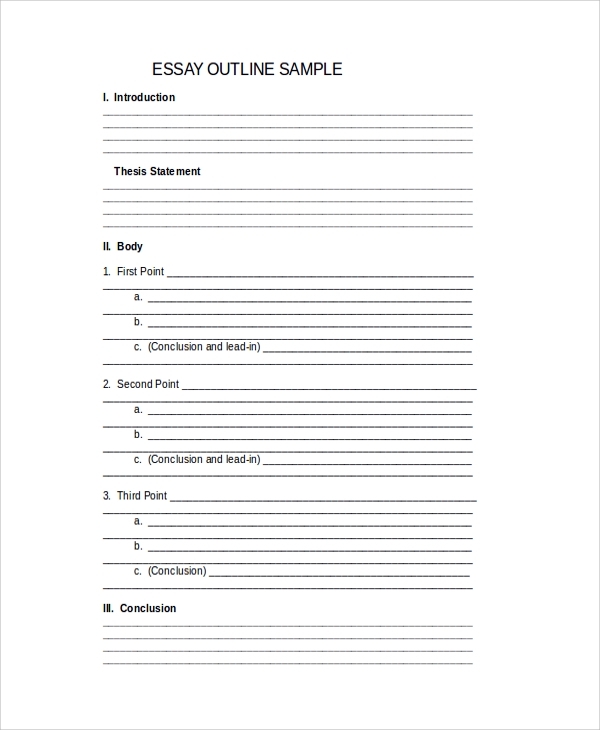 This essay outline template contains a perfect format to write the best essay. It has provisions for writing an introduction, thesis statement, body with points and sub-points, and finally a conclusion following the guidelines. 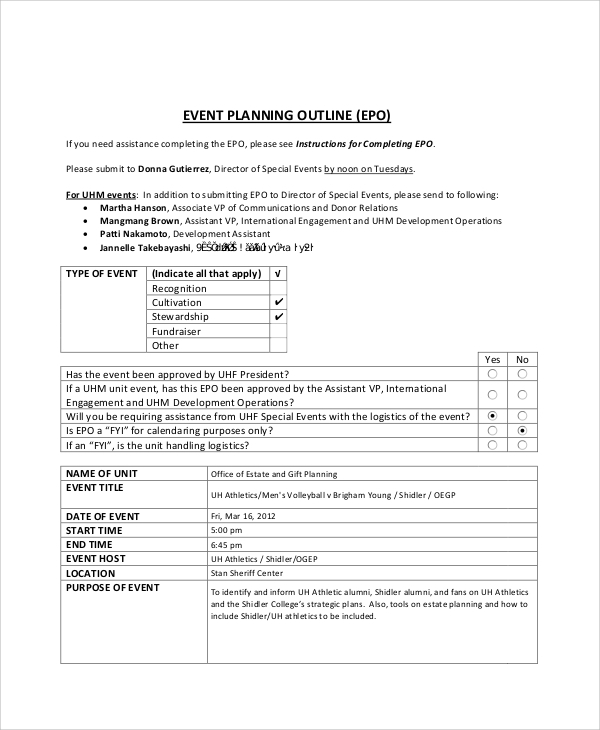 This event planning outline sample is a perfect and complete document for managing and executing any event smoothly. It contains a provision to write down all the relevant data and information in a tabular form with a subject and description. It also has many checklists which will help to conduct the event sequentially. Formal outlines are important while writing reports, thesis, and official documents. 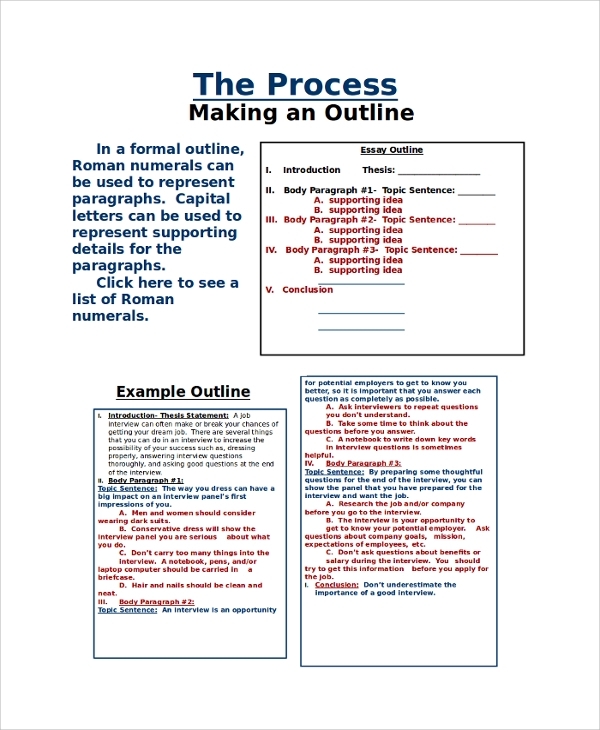 This formal outline sample provides all the guidelines to define, describe the topic and purpose of it. It provides all the required elements and formats to prepare the formal outline in best possible way. 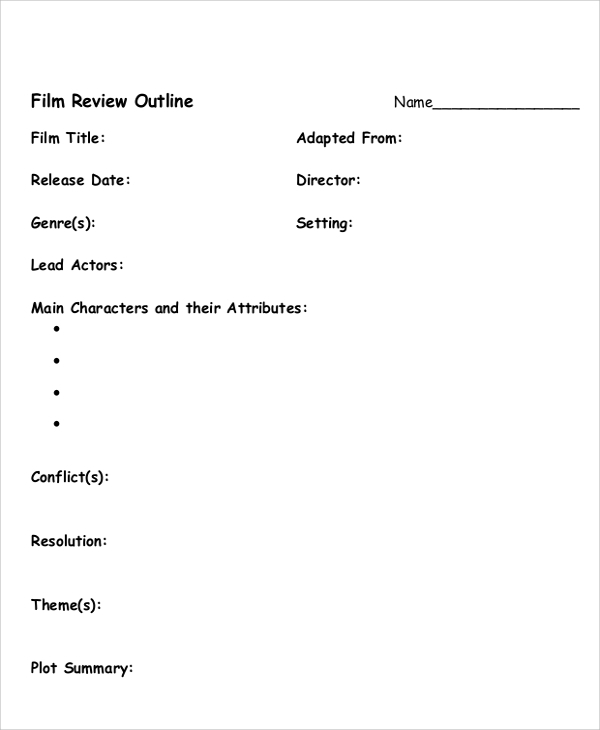 This sample outline will help the new film critics to review a film and publish a review in the most professional way. It contains all the necessary points that the critics must keep in mind while watching the movie and note them down for publishing it in an article form. 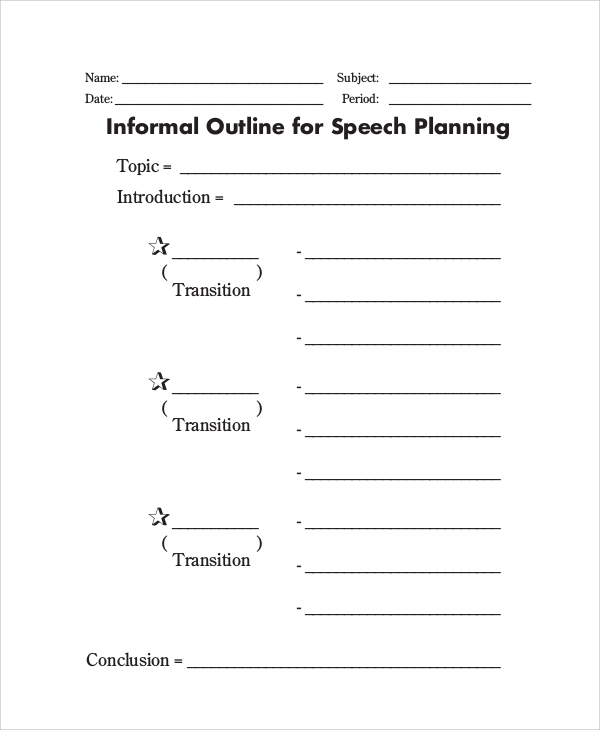 An informal outline is required when you are about to speak on a topic and provide a presentation. You can take a note of the points to be covered and prepare a list of things to do sequentially. This is an interview outline for the interviewers to plan the interview beforehand and judge and note the important points of a candidate during the interview. Such outline will help you in judging the candidates on the same scale and provide clear judgment. 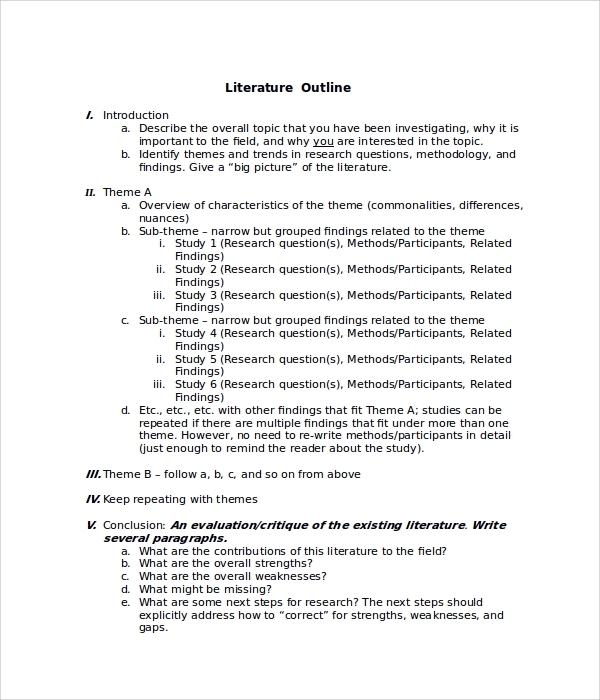 This literature outline sample provides all the guidelines needed to write a book related to literature. It describes the points to be included in the introduction part, different ideas about the themes and sub-themes, the necessary elements, the procedure of repetition of themes, and how to write the conclusion to create an ever-lasting impression. 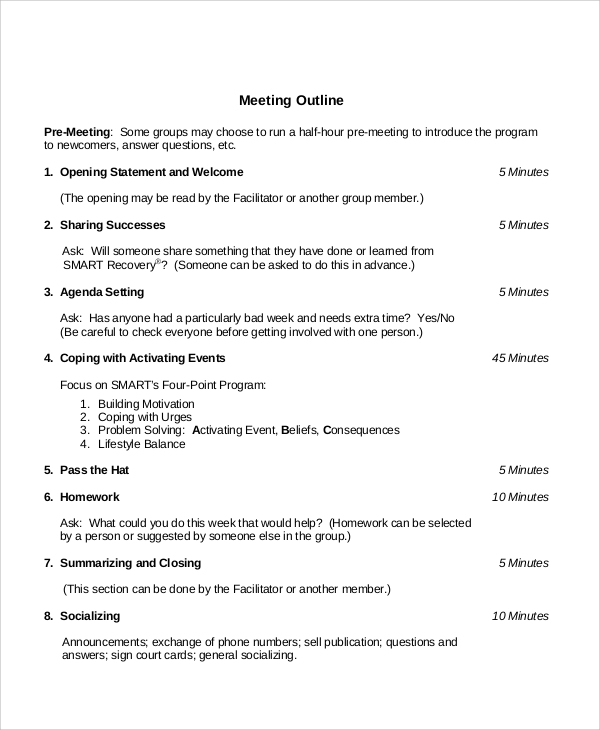 A meeting outline is helpful in making all the points to be discussed in a meeting and the scheduled time for that. It helps individuals to prepare themselves for the meeting as it has a provision for an opening statement, sharing vital points, agenda-setting strategies and summarizing and closing with the best impression. The presentation outline sample contains all the provisions to make a successful presentation effortlessly. It gives all the guidelines as to which page should contain what and the format for that. 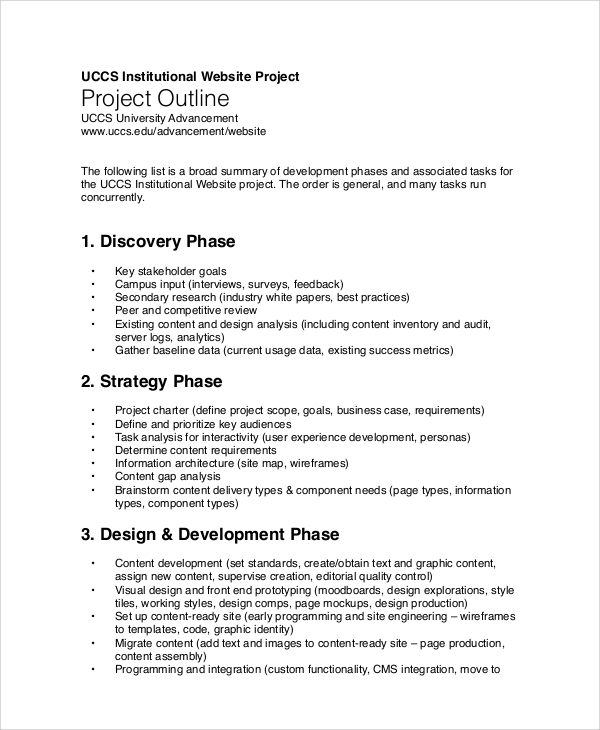 This project outline sample contains the different phases of a project development and its usage. It will help the newbies to plan their projects with professionals and get a hand-on experience. It outlines the phases such as discovery, strategy, design, development, launch and maintenance. 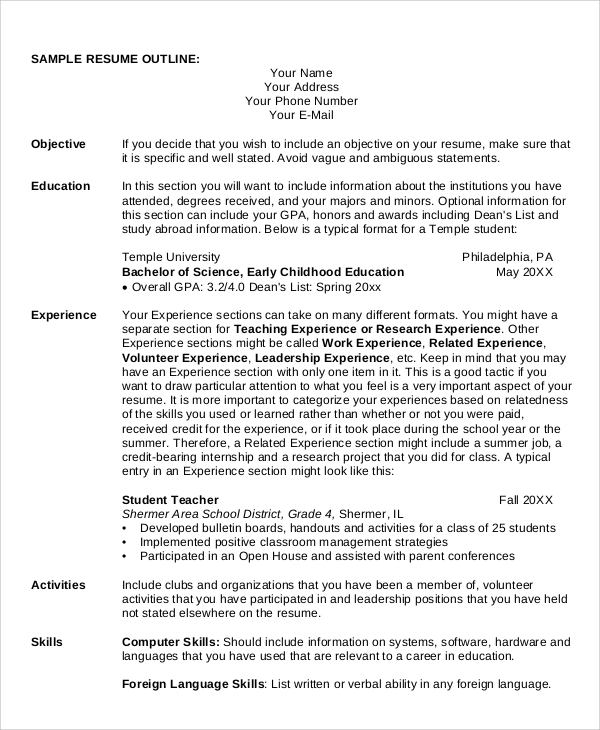 This is an amazing resume outline sample for the freshers or the experienced candidates. It states how to write the objective, educational qualifications, experiences, activities related to the jobs, skills, and other highlights to present a perfect resume. The above outline samples will help the corporate companies a lot in planning out events and strategies. Say for example, a business plan will help the entrepreneurs in getting started with fool-proof planning, a business report from management team will help the stakeholders understand the current status of the company, marketing team can analyze the competition and formulate strategies to increase the sales figure, and so on. On an individual level, outlines for resume, cover letter, speech writing and wedding planning will help to achieve personal milestones and conduct events smoothly. It will make the event go smooth and as per planning. The target audiences for the business plan outline samples are the entrepreneurs who are going to start a new venture. Business reports are meant for the management and executives; project outlines are intended for the project managers and team leaders. Essay outlines, literature outlines, and chapter outlines are for the professional writers and the aspiring ones. Similarly, resume, cover letter and speech and presentation outlines are for the students and any individual for that matter. The above-listed outline samples are very useful in both the corporate and personal life. It will help the executives and the management team to prepare reports and business plans with proper assessment and guidelines. They are indispensable for the entrepreneurs for planning out things before getting started. On a personal level, resume, cover letter, wedding, event and informative speech outlines will help to nail the event the way you plan them.